Interested in getting started with the UI controls that are built-in to Silverlight 2 (beta 1)? Want to know how all of them work and nuances involved in using them? You don't? Then this post is wasting your time and you are officially un-cool </jest>. For everyone else, I want to bring your attention to a big article I recently wrote for ASP Alliance. 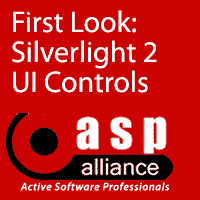 Titled (quite plainly) "First Look: Silverlight 2 UI Controls," the article covers in detail all of the UI controls built-in to the first beta of Silverlight 2. My goal was to provide you with a comprehensive look at the UI tools inlucded in the box so you can quickly transition from the familiar ASP.NET or WinForms development you're doing today. Even if you've never dipped your toe in the Silverlight pond, you'll find this article very helpful in getting you familiar with Microsoft's newest .NET UI platform and its tools. If you're looking for a more basic introduction to Silverlight, check out my Silverlight 1.1 Alpha Short Cut on O'Reilly or my recent Silverlight 2 Deep Dive slides. But since the article is soo complete (about 7000 words), I won't bloviate here. Jump over to ASP Alliance and give it a read if you're interested and watch for updated versions as the Silverlight plug-in matures.